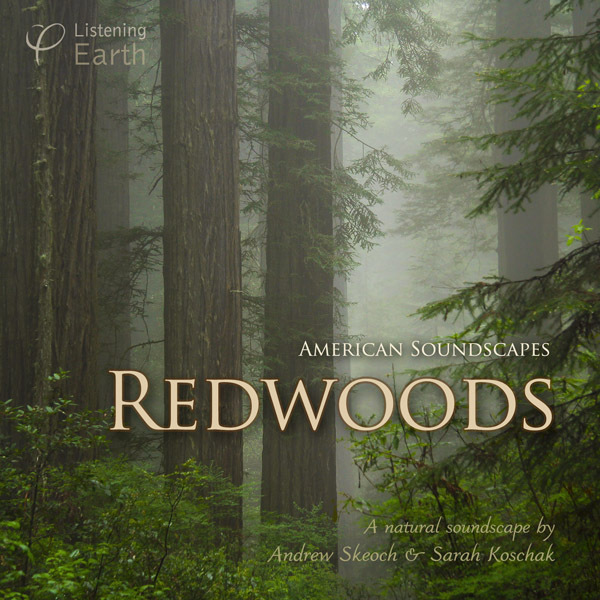 Redwoods - listen to an ancient grove of Redwoods, on California's northern coast. Enter an ancient grove of Redwoods, on California's northern coast. Life-sustaining mists drift in from the nearby Pacific, swirling between magnificent, straight-trunked trees. It is dawn, and in the half light, the first birdsong is heard; the ethereal singing of Varied Thrushes. Soft yapping cries come from above the canopy as Marbled Murrelets wing overhead. Soon other birds awake; sparrows, warblers and ravens, to join the growing dawnsong. Later in the day, we sit quietly by a shallow stream as it flows through the forest. Dappled light filters through the trees, and delicate birdsong permeates the air. The next morning, there has been a heavier mist. 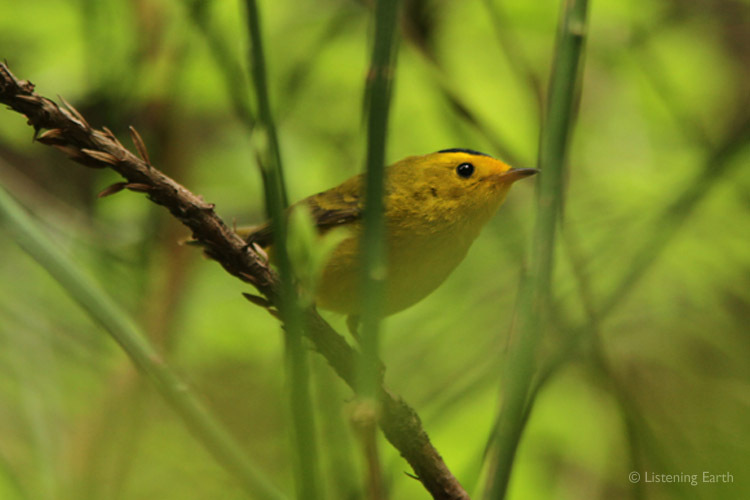 The forest's dawn chorus is added to by the gentle patter of dewfall. The Thrushes encore, along with the distant calling of a Barred Owl. This album is presented in three scenes: a first dawn, an afternoon, and another dawn. 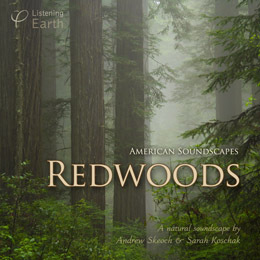 The afternoon sequence is particularly spacious and relaxing, the dawn recordings fascinating and evocative. The ravens in these redwoods are rather characterful, giving all kinds of gargling and croaking calls. We were so delighted to capture the sounds of Marbled Murrelets. These small seabirds spend the day feeding at sea, before returning to roost high in a Redwood. They are a rare species, very endangered, and we are privileged to hear them as they wing seawards on their morning 'commute'. Mp3 is a universal audio format, playable on iPods, computers, media players and mobile phones. Mp3 is a compressed format, allowing smaller filesizes, offering faster download times and requiring less storage space on players, but at some expense to the audio quality. Many listeners can't really hear the difference between mp3 and full CD-quality audio, and hence its convenience has lead to it becoming the default option for audio. Our albums are generally encoded at around 256kbps (sometimes with VBR), balancing optimal audio quality without blowing out filesizes excessively. We encode using the Fraunhoffer algorithm, which preserves more detail in the human audible range than the lame encoder. Our mp3 files are free of any DRM (digital rights management), so you can transfer them to any of your media technology. You've paid for them, they're yours for your personal use without restriction. Mp3 files can be burned to disc, either as an mp3 disc, or an audio CD after converting them to a standard audio (.wav or .aif) format first. FLAC is a high-quality audio format, allowing CD-resolution audio. It is ideal if you wish to burn your files to a CDR, or listen over a high resolution audio system. However files usually require special decoding by the user before playing or burning to disc. FLAC (Free Lossless Audio Codec) is a LOSSLESS compressed audio format. This means that it preserves the full audio quality of a CD, but optimises the filesize for downloading. Typically, file sizes of around 60% are achieved without any degradation or loss of audio quality from the source files at the CD standard of 16bit/44.1kHz. Obviously the file sizes are larger than for the mp3 version - usually around 300-400Mb for an album, compared to 100Mb for an mp3 album. In addition, you'll need to know what to do with the files once you've downloaded them. In most cases you'll want to decode the files to wav or aiff, either to import into programs like iTunes, or burn to CDR. Some programs will play flac files natively.